Written by: Malone on June 9, 2012. Hollywood loves pretty boys, but every once in a while a real man’s man comes around. Burt Reynolds. Charles Bronson. Steve McQueen and Clint Eastwood. These guys certainly weren’t your modern Ben Affleck types, Doc. But when I think of a “man” there’s one who stood head and shoulders over his contemporaries as the very definition for his time. Al Bundy. There was a sense of honesty in his suburban defeat. His lack of integrity and tired demeanor seemed to ring a bell with thousands of American men who were slowly losing their masculinity. A society witnessing a collective decline in testosterone that would eventually pave the way for the Keanus and the Biebers and the Ashton Kutchers of the world. The same society that would soon freely use the word “metrosexual.” Perhaps the last bit of manhood Al Bundy could hang on to was The Duke and even that proved to be elusive. Once a year, Hondo would show on television and Al would do whatever he could to watch it. For whatever reason, his plans would always be thwarted. Fortunately for Al Bundys everywhere, Paramount Home Video has released Hondo on Blu-Ray. Now you can watch it whenever you need to feel like a man. One fine day, Angie Lowe (Geraldine Page) and her six year-old son Johnny (Lee Aaker) have a drifter show up to their homestead by foot. The man is Hondo Lane (John Wayne), a half Indian/half Caucasian who had been riding dispatch for the US Cavalry. A few days earlier, he lost his horse in an encounter with some Indians and asks Angie if he could work on her ranch in exchange for one of hers. She tells him her husband is out in the mountains and should be back any time now, but seeing as how a ranch hand recently quit she could use the help. Over the next couple of days, Hondo does some maintenance work and calls Angie out on her fib – her husband hasn’t been around for months. Before leaving with his new horse, he warns her that the Apaches are killing settlers and she should leave soon – a notion she quickly dismisses. Back at his Cavalry post, Hondo gets into a scrap with a man who turns out to be MR. Lowe, a louse of a man whom he eventually kills in self-defense. Hondo reports of the Apache massacres to his commanding officer, then returns to Lowe’s ranch. There, a relationship with Angie begins and while he lets her know her husband is dead, he keeps it a secret that he was responsible. Will their relationship be able to survive the truth? Will they be able to survive the impending war between the white man and the natives that will soon catch them in the crossfire? Interestingly enough, Hondo, made in 1953, came at a time when 3D movies were seen as the future of cinema. 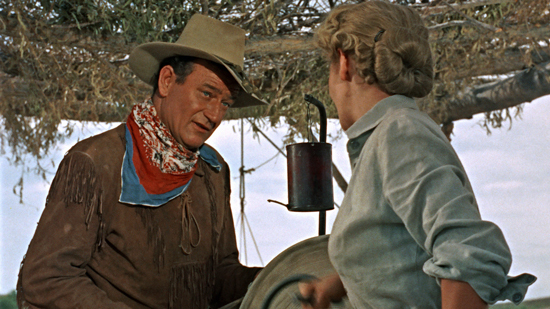 John Wayne and his producing partner wanted to shoot the film in 3D and Warner Bros. (the company that originally distributed the picture) supplied the equipment for it. While today, everything seems to be shot in 3D (sometimes to the chagrin of moviegoers), most folks actually seem to WANT Hondo released in its three dimensional glory. Unfortunately, Paramount only put this one out in 2D. It doesn’t really seem to matter – the story and action are good enough that the film doesn’t need to rely on 3D gimmicks. However, during one fight scene, things point out at the screen and it’s glaringly obvious these shots existed solely to showcase the medium. It could be due to the picture being filmed in 3D, but I noticed several shots on this disc were blurry. For the most part, the film looks grainier than usual – not nearly as clean a transfer as I’d expect from Paramount. Keeping in mind that the film is sixty years old, I suspect they did the best they could with whatever elements were available. The colors are clean and bold, but at times artificial… kind of like eye candy made with sweet ‘n low. Again, most likely a sign of the times (in this case, “Warnercolor” was used) and it’s probably the best quality you’ll ever see for this film. Sound is good, available in an underutilized (and completely unnecessary) Dolby 5.1 TrueHD mix as well as the original Mono track in Dolby TrueHD. 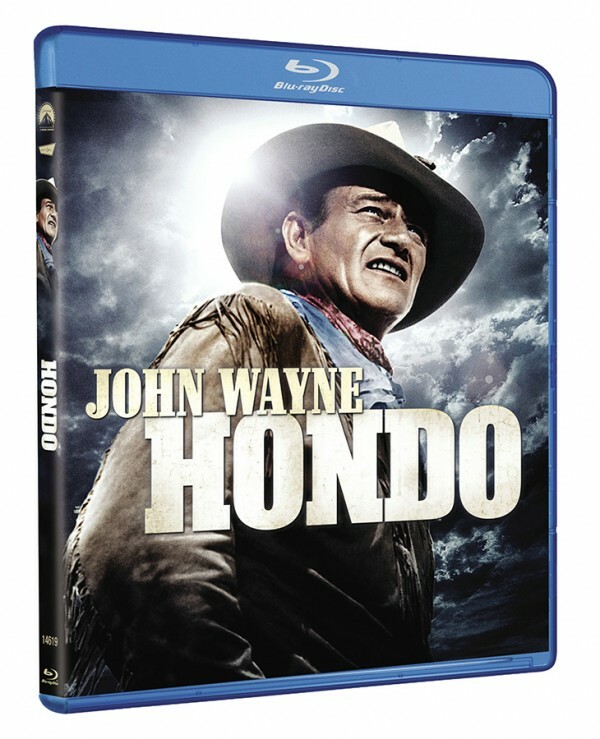 As far as extras go, Hondo has some good ones… but they’re recycled from a 2005 DVD release. Leonard Maltin introduces the film as well as provides a commentary with Western historian Frank Thompson and the actor who played little Johnny, Lee Aaker. 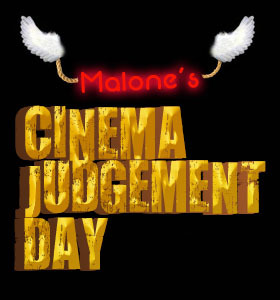 As you’d expect from Maltin, this commentary is chock full of information. It’s entertaining, but feels like an extended introduction to anything you’d see on TCM. 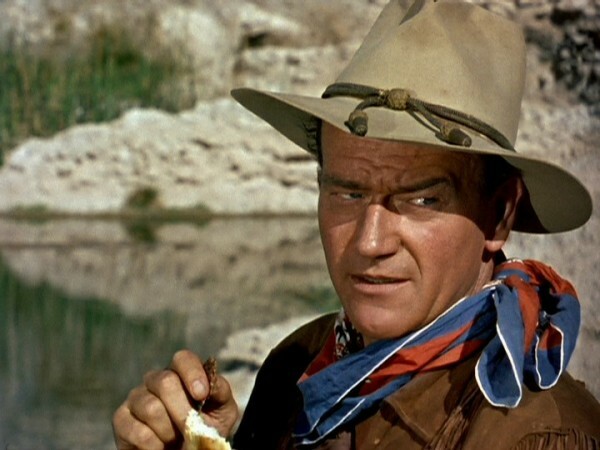 A multi-part featurette discusses the making of Hondo, profiles screenwriter James Edward Grant and looks at lifelong John Wayne friend and co-star Ward Bond. “From the Batjac Vaults” is a 1994 spot from Entertainment Tonight where Leonard Maltin actually visits the vault of the estate of John Wayne, shown around by the star’s late son Michael. 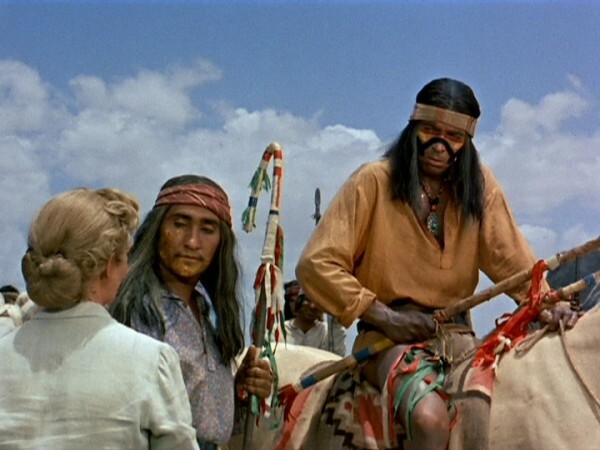 There’s also a fifteen minute look at the Apache Indians, which is fitting as Hondo is one of the few Westerns, especially of that era, to take a sympathetic look towards the Native American and their way of life. An included photo gallery provides plenty of production stills in crystal clear black and white. I’m not usually a fan of photo galleries, but these shots are simply gorgeous and certainly a welcome high-def addition to the disc. Last but certainly not least, the theatrical trailer is included – as it should be. I give Hondo 3 out of 4 angels. This is the finest the film’s ever looked and the first time it’s been presented in widescreen. While die-hard fans will be disappointed there’s no 3D option, I’d say it’s worth owning if you love Wayne or Westerns in general. Pass it by if you don’t like the genre or can’t get into older films. For better or worse, they really don’t make movies like this anymore. Then again, they really don’t make men the way they made The Duke anymore, either. It’s a shame, Doc – it was a good way.